Are you searching for high-end hardwood at an affordable price? When it comes to flooring, our specialists know that few materials match hardwood in terms of beauty and longevity. Hardwood flooring offers the ultimate aesthetic appeal, and it's an investment that can last generations with proper care. At our showroom, you'll find stunning collections that include a variety of species, grains, glosses, finishes, edge and end types, and brands. Finding the ideal solid or engineered hardwood floor is easy when you team up with our associates, so come by soon to start exploring your options. 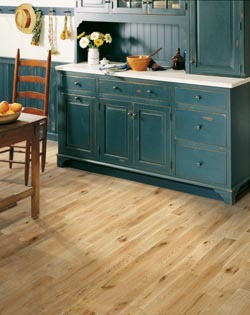 Aside from its inherent strength, one of the most coveted aspects of hardwood is the sheer number of styles available. From popular hickory, oak, and maple to rich cherry and exotic products, you'll discover a matchless spectrum of hardwood floor options as unique as your vision for your home. Naturally occurring variations in each kind are what make hardwood a distinctive flooring choice that never goes unnoticed. Are you looking for hickory with low gloss and moderate variation? Or, perhaps you're looking for deep cherry with some variation, and a beveled end type? No matter your preferences, you're sure to find what you're looking for at our store. Whether you prefer the rugged appeal of hand-scraped wood, or a smooth surface that conveys superior sophistication, our flooring showroom is ready to connect you with your ideal flooring. Choosing hardwood from our selections ensures you’re getting a stylish, durable floor that is low maintenance and long lasting. This flooring is known for adding value to any property and instantly adds appeal for homebuyers searching for a new home or office. When you browse our flooring store, you'll find a large collection of highly rated hardwood floors to enhance your home's appearance and, with proper maintenance, last for years into the future. We carry beautiful solid and engineered hardwood floors that garner the attention of any visitor and complement any décor, furniture, and overall theme. Turn to us when you want to upgrade your home or business with a stunning product you know will last a lifetime. Depending on your home's individual appearance, one type of hardwood flooring may be more suitable than another. If you're unsure which is the right choice for your house, don't hesitate to speak with our showroom team about your options. We're happy to provide a professional recommendation, tailored to suit your budget and your personal tastes. Upgrading your home’s flooring significantly adds value and appeal to any business or home. However, it makes sense to invest in the help of a seasoned flooring installation team, as well. Our specialists have the tools and experience needed to add flooring of every length, width, and thickness to your home. Come by today to learn how we simplify the process. Hardwood is a high-end product that requires an expert's touch. It can be difficult to install evenly and safely - that's why it's well worth your time to schedule professional hardwood flooring installation with our team. In fact, we recommend that all our clients consult our specialists once they've settled on their purchases. Otherwise, they may run the risk of damaging their purchases before they can even begin to enjoy them. Contact our showroom today to browse our extensive selection of hardwood floors. We're proud to serve customers throughout Flower Mound, Dallas, Lewisville, Highland Village, and Grapevine, Texas.